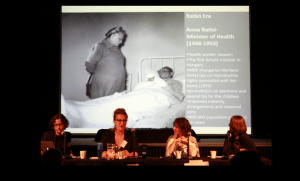 In September, Marta Kotwas, Dr. Eszter Tarsoly, and Dr. Nevila Pahumi represented SSEES at the London Amnesty Festival of Choice, and more recently, Dr. Rory Archer and Cara Spelman convened a panel discussion in honor of International Women’s Day. Through these related conventions, SSEES has made solid effort to highlight the connectivity of these pressing questions between Eastern and Western Europe, and it has also made remarkable strides to link this research to fellow academics, activists, and organizations across London. In October, the London branch of Amnesty International hosted a one-day conference on reproductive choice. The three panels and two talks explored multiple interconnected issues that relate to choice and access to abortion care all around the world. The SSEES panel, represented by Marta Kotwas, Dr. Eszter Tarsoly, and Dr. Nevila Pahumi contextualized these questions within the frameworks of activism, language, institutional practices, and forced sterilization in Eastern Europe. Marta, who has been running the feminist activist Dziewuchy Dziewuchom (Gals for Gals) since spring 2016, gave the panel a dire depiction of the developing struggle between Polish activists, the current right-wing government, and society at large on severe restrictions on abortion rights. Notably, the panel was organized on the very eve of the now popularly defeated proposition to criminalize abortion by the Polish parliament last autumn. Important takeaways from Marta’s research were that restrictions do not eliminate abortions; rather, they only make the procedures illegal and unsafe, further endangering a woman’s life. Ironically, Poland already happens to have one of the lowest abortion rates in Europe as we write! Dr. Eszter Tarsoly next awoke the audience to the key role that language plays in discourses of childbearing and the activism of the abortion divide, particularly right-to-life. Eszter’s linguistic research begins with the early modern Hungarian context, highlighting key examples of representations of pregnancy that appear on the record with the first Hungarian Calvinist Bible and stretches into the modern day demonstrating the emotionally laden language of right-to-life and population control activists in which being single suddenly appears taxable (‘szingliado’ tax) and that unborn ‘European’ fetuses get more sympathy in the media and the public than ‘foreign’ refugees. 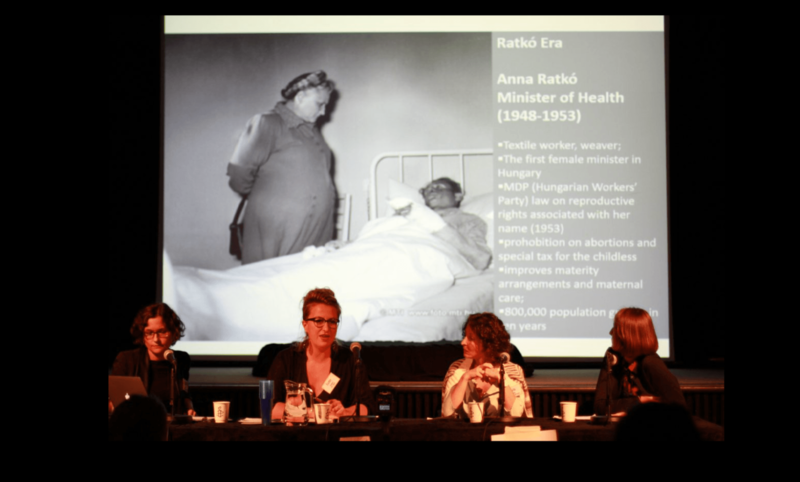 Dr. Nevila Pahumi, who is researching women’s health clinics in Eastern Europe during the communist era, provided a historical dimension to the discussion, offering insight into how women’s healthcare developed alongside rapid industrialization in the communist world. Key to Nevila’s presentation were the challenges of the institution in living up to its idealized form as a space of knowledge and empowerment for women. With lack of funding and a now decreased role in community building, women’s health clinics are not providing solutions for young women who undergo controversial procedures like hymenoplasty in the private clinics with the purpose of being ‘(re)virginized’ for what is framed as a ‘narrow’ and ‘competitive’ marriage market. Finally, our external colleague from LSE, Aleksandra Stankova, presented another side of the coin in discussions of the absence of choice: the forced sterilization of minority women. Roma and mentally disabled women, in particular, are among the vulnerable categories of persons who have faced the procedure at certain points in the communist era (former Czechoslovakia) and may be at increased risk again today. Aleksandra, too, concluded on the pressing note that while the practice seems to have been limited to the past, and legislation is in place to include Romani people, cases of forced sterilization are again being reported out of the region, though figures are hard to come by. Since then, we have witnessed a few rocking events which inspired us to revisit these earlier conversations. 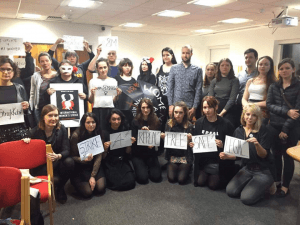 The success of Czarny Protest in Poland this past October has been a cause for celebration. However, a growing rollback of women’s rights across Europe, coupled with Brexit-related anxiety about interruptions to mobility, and the global marches of female solidarity on the wake of protest of Trump’s election in the USA, are all reminders that the need for activism and debate continues. We were particularly grateful that Dr. Rory Archer and Cara Spelman convened a new panel to broaden choice-related questions in honor of international women’s day on March 8th. In addition to our SSEES core, Rory and Cara also reached out to fellow academic and activist colleagues Dr. Rebecca Steinfeld and Eleanor White whose work allowed us to broaden our previous conversation and push it into new directions and themes. Rebecca, who is a visiting researcher at Goldsmiths and a leader in the campaign to legalize civil partnership, began the panel discussion with an explicit focus on the implications of reproductive justice. Her talk exposed the limitations of pro-choice debates, and introduced some of the often-difficult questions that reproductive justice that Europe faces at the moment. Part of what the focus from ‘choice’ to ‘reproductive justice’ aims to achieve is, to expand the sometimes theoretical definition of ‘choice’ and ‘rights’ to include the dignified upbringing of children. Notably this switch in research, and hopefully also activism, seems promising in that pro-life activists offer no alternatives to childcare, which is an important concern for would-be parents, and indeed, a consideration that can lead to abortions. Some of the pressing concerns for reproductive justice that Rebecca has identified are: refugee access, general lack of access, as well as birth injustice. Next, Eleanor who has long been an abortion rights activist in Ireland and now, London, took us into the challenges of campaigning to repeal Article 8 of the Irish Constitution which bans abortions. 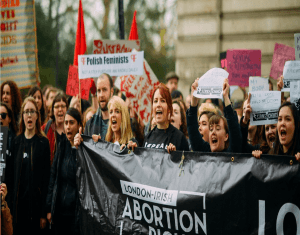 Eleanor’s activism here in London is especially important as England and London, in particular, are the nearest available destinations for abortion seekers from both Northern Ireland and Ireland. With the lack of understanding about restrictive laws in these parts of the UK, Eleanor’s work, and by extension, that of London Irish Abortion Rights Campaign remains important to highlight the horrendous challenges that women undergo to reach safe care so long as restrictions remain in place. Marta and Eszter, once again, provided fresh reminders that while local context varies from place to place, the challenges faced by pro-choice of the abortion divide have a good deal in common as well. Both Marta and Eszter shared powerful examples of emotionally charged language in which unborn fetuses are cast as victims of abortion (Hungary), and abortion itself is a ‘crime against humanity’ (Poland). In addition to demonstrating that language is a key nexus of analysis surrounding pro-choice, their work also shows a similarity to the debate in the USA that calls itself ‘pro-life’. Eszter called for the importance of reframing the debate, in which a name change from ‘pro-life’ to ‘anti-choice,’ at least within the reproductive justice movement, could be a useful first step. (She has also pointed out that while legislation concerning the right to abortion remains unchanged in Hungary at present, two Budapest-based hospitals have recently been granted government funding on condition that doctors refuse to perform abortions in these settings.) Making clear the conservative thread informing the anti-choice ‘pro-life’ angle across Europe, Marta shed light into how Polish hospitals and medical professionals themselves are treating the refusal to perform abortions as a matter of conscience, evoking some of the tunes heard in the USA around the provision of contraception by religious employers. A composite view of all this impressive body of work being done shows, above all, that protest remains a powerful tool of combatting restrictions on women’s choices. The criminalization of abortion has a relatively modern history that is tied invariably to nationalism, religious conservatism, as well as the professionalization of medicine. Taking full stock of the complexity of this issue which impacts women all across the world in, varying form, clearly involves an understanding of language in time and place, as well as deep critical analysis. This is where academic research and activism have their work cut out for them: abortion-related education has many goals and dimensions and it needs to be constant and comparative. Defending and celebrating reproductive choice is, of course, very important. But the way in which the counter-response to choice is being framed in highly emotional tones, is only one indication that we need new tools to reframe the issue. In this view, turning from ‘choice’ to reproductive justice, we are presented with new opportunities to combat what in essence is the fight to promote the development of female subjectivity to its full human potential. Reproductive justice, as Rebecca’s work most notably urged us to think, is not exactly new in academic focus. The notion of ‘reproductive justice’ was framed by academics and activists of color who worked at the intersection of race, class, sexual orientation, and disability and age in the mid 1990s. The shift was important because they transcended the vague discourses of reproductive choice and rights, to encompass reproductive experience and ability to access such related healthcare services. In doing so, reproductive justice does indeed seem to provide powerful breakthroughs to those of us who engage the pro-choice of the abortion divide through research and activism. Reproductive justice activists tackle other hugely important but sidelined issues in the pro-choice/pro-life debate such as the right to bear and bring children up with dignity as well as taking stock of key components like: contraception, reproductive technologies, surrogacy and pregnancy to birth, infant feeding, parenting, and childcare. At the conclusion of the panel, some members of the audience were particularly keen on the kinds of language and education that could be used to lower abortions. And while we gave a variety of answers beginning with measures already taken in the arena of sexual education, the significance and problems with establishing broad alliances with fellow activists, it would seem that a broader awareness of what reproductive justice is and what it seeks to do might go much farther than any other one-dimensional approach.